The Supreme Court has just given the transgender community a big blow. 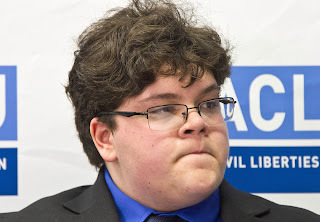 It decided not to hear the case of transgender student Gavin Grimm who is a girl who thinks she is a boy. Grimm is currently receiving hormonal therapy in order to appear "boyish" and changed her name. The nation's highest court sent the case back to a lower court after the Trump administration rescinded Obama's order which allowed students to use the bathroom of their choice (see: http://www.sacerdotus.com/2017/02/trump-removes-obamas-bathroom-policy.html). Lawyer Kerri Kupec who is defending parents, schools and the state from the Alliance Defending Freedom stated, “The first duty of school districts is to protect the bodily privacy rights of all of the students who attend their schools and to respect the rights of parents who understandably don’t want their children exposed in intimate changing areas like locker rooms and showers." The Fourth Circuit Court of Appeals had ruled last year that Grimm had the right to use a public restroom. However, her school district did not allow her to use the locker room. This was unacceptable to Grimm's lawyers. Today's Supreme Court decision is being praised by parents and others who are worried for the privacy and safety of their children. As one can imagine, allowing boys into the girl's restroom or locker room can be dangerous, and vice-versa.